Every month is dominated by the weather, but wet, wet, wet August has provided particular challenges. There are three fields of hay still to be cut and they may end up as silage, a crop we have ever had to take. The shortage of aftermath grazing – when the animals clear up after the grass crop has been taken – means that some fields have had no rest. The good side to all the rain has been lush grass growth, so there has been no shortage, even if the quality is less than ideal. The ewes and lambs were moved onto our one successfully – cut hayfield, to finish. The cows went into the back field where the sheep had been. It is easy to keep an eye on them there as they don’t want too much grass at this stage or they will produce more milk than they need, after they calve. 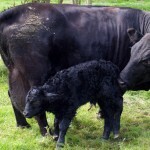 Babi, our oldest cow, calved by herself on 23rd August. 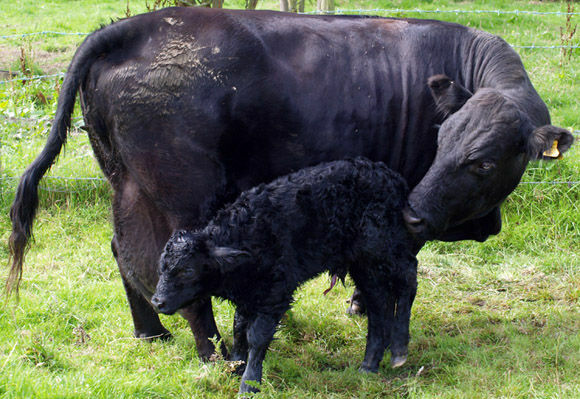 At half past eight in the morning, she was looking ready to calve; an hour later, she had a strong bull calf – Eban! has ripened,despite lack of sunshine- plums, damsons, blackberries and raspberries have all added a spot of colour at breakfast-time. The pear tree, which scarcely produces a single pear most years, has yielded several ripe fruits. The Farmers’ Market stalls were borrowed for the monthly Anglesey Producers’ Market, held outside on a lovely sunny day. This regular event is most welcome as an outlet for quality local food and replaces the much lamented fortnightly market in Bangor which ceased to operate in June 2007. The market was started with the help of Anglesey County Council, and more information can be found on their website here and here. September’s market is at Ysgol David Hughes on the 20th. This entry was posted on Saturday, August 30th, 2008 at 5:05 pm and is filed under Diary. You can follow any responses to this entry through the RSS 2.0 feed. Both comments and pings are currently closed.